Grenada Village is the site of one of the great engineering achievements of 19th century New Zealand. Seton Nossiter Park contains the remains of the famous Belmont Viaduct that traversed the steep gully beside Mark Avenue. The viaduct was a memorable and distinctive part of this country's early transport system. The original gigantic wooden span played an important role in developing early Wellington, as not only did it open up the city's northern boundaries, it also provided access to the 'hinterlands' of Horowhenua and Manawatu. 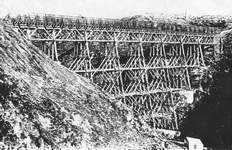 The viaduct was constructed for the privately owned Wellington & Manawatu Railway Company in 1885 and was the largest wooden structure of its kind in New Zealand. It was at the time reputed to also be the largest wooden viaduct in the world, however this was later disproved as some spans in Canada were bigger. Its construction was regarded as being a marvel of engineering in its day and was an extraordinary and outstanding accomplishment for the time. 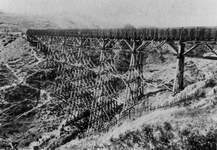 The viaduct was 125 feet above the gully floor (equivalent to a 13 story building) and 341 feet long. 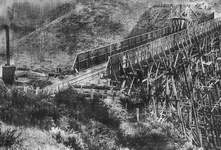 The main uprights of the trestles and cross-spars were 14 inches by 14 inches of solid kauri, each 40-foot long. A total of 212,000 superficial feet of well-seasoned kauri timber was used. Most of the timber was milled up country and brought by sea into the Porirua harbour. Bullock teams then dragged them to the site. A total of 35 tons of wrought iron bolts, nuts, washers and fastening braces was used. The uprights stood on 14 concrete foundations in the gully with some of the piers sunk 20 feet into the bed of the stream. The Belmont Viaduct was described at the time as looking like a gigantic web, or the puzzle of a dreaming geometer. The structure was designed by Mr. Harry P Higginson using the experience he had gained in Russia and India. It was then built by Mr. Morton Danaker, a Scandinavian specifically appointed for the construction. The viaduct was built in sections on the ground and the contractor achieved his greatest triumph by raising each structure section by section, as they were ready, by using a block and tackle arrangement. To do this, tunnels with ‘T' shafts were built into each side of the valley and these shafts housed huge beams. Through each beam, a wire cable was slung and on this the contractor put a block and tackle arrangement and was able to raise the viaduct section by section. It must be remembered that this was more than 130 years ago. In the early 1900's, the railway company decided to reconstruct many of its original wooden bridges and consequently a prefabricated steel bridge was erected around the old wooden structure, on the same centre line, with rail traffic not delayed for even one hour. A travelling gantry arrangement was erected over the track so trains could continue to pass underneath. The steel viaduct was prefabricated in USA and imported and erected in 1903. It was supplied by the American Bridge Company and shipped out to Wellington. The old trestle could have lasted for many years longer, but the threat of fire was of great concern to the company. The loss of the viaduct would have had a devastating effect on their service because of the time a replacement would have taken to construct. In 1908, the line was purchased by the government and became part of the North Island Main Trunk Line. By 1937 it had reached the limit of its capacity and the new double tracked Tawa Flat Deviation tunnel was opened. As a matter of interest, the tunnel is positioned precisely under the old viaduct beneath the valley floor at a depth of 24.5 metres (80 feet). 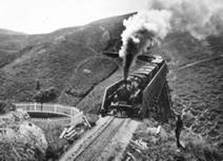 As a consequence of the opening of the deviation, the old and steep hill route was permanently terminated at Johnsonville and the viaduct abandoned after carrying steam trains for 52 years. 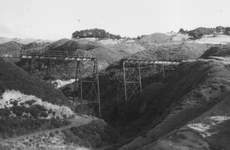 After rusting away for 14 years, it was agreed in October 1951 that for public safety reasons, the complete viaduct would be removed at the first suitable opportunity. Arrangements were made with the Army to use explosives in training exercises. 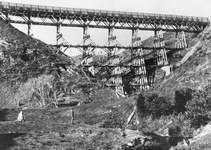 The viaduct was 'blown up' by local territorial Army engineers on 15 December 1951 after standing in place for 66 years, both in wood and steel. The removal of the Belmont Viaduct was the passing of an era and gives Grenada Village a permanent mark of distinction. The impression of the original height has now been lost because of the nearby motorway embankment, the Mark Avenue filling, and the fact that the tops of the surrounding hills have been levelled for housing. However, when standing at the bottom of the gully today an idea of the viaducts former size can be imagined.